For a long time I've been convinced that Pastor's in the UK should be trained first and foremost as if they were going overseas in mission. To "do" church in the UK, and therefore implicitly to be involved in witness, is a cross-cultural activity. I'm not particularly thinking of how the ethnic make up of the UK has changed, although that certainly is a factor, but that our culture has changed which means any engagement outside of the church is cross-cultural. Here's a story to illustrate. An Australian friend commented that some people in his homeland upon encountering a "biblical nativity" scene angrily exclaimed, "would you look at that, these Christians are trying to take over Christmas now!" I think this could as easily happen in Glasgow as Sydney. "True inculturation of the faith cannot make use of outmoded cultural forms"
"before any experience of faith can be celebrated in community, we have to ask ourselves about symbols and gestures, the attitudes, and the translation of the message we use. Everything must correspond with the center of peoples' lives, taking into account their tradition and history"
"I did not feel called to become the manager of a form of decaying Christianity, bound up in its doctrine and discipline, so I decided to keep my distance from a model of a church designed elsewhere by people who do not know the conditions of the mountain peoples"
You can watch Ela speak here. 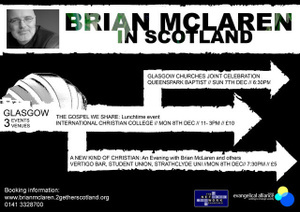 Brian McLaren is doing a series of events here in Scotland (Perth, Edinburgh & Glasgow). I've only read one of his books but have heard him speak a couple of times. So what can I say? Well he's an engaging speaker and I think for many church contexts in Scotland will bring a "Prophetic" challenge. Yet in saying that he's not actually that cutting edge in his practice (and does not represent all that is to be said of or by the emerging church - if indeed we can still use that tag), and it will be interesting to see if the medium of the message is juxtaposed with the message. I recently went to an event where people where "sharing their stories" of innovative ways of church/mission. One of my big issues with the event was that they did not seem to understand the difference between presenting and sharing. The presentations verged on sales pitches and while the seating was informal and there were the ubiquitous break out type group moments the medium of the event was in contract to the idea of sharing and of the kinds of ways of doing mission that were being talked about. Don't hear me wrong - the things that those who were presenting are involved in was by-and-large good stuff - it was the way that it was communicated that got me, which is ironic as they were all involved in innovative ways of communicating the Gospel etc. Perhaps the Soliton Sessions in Belfast & Portrush (2007) spoiled me with regards to how to do an event about mission and church that is inclusive, inspiring, encouraging and and has the potential to generate friendships and support. Anyway - whatever the format of the McLaren events take - I'd encourage you to go along. That said I think when it comes to talking about ways of doing mission and church I'd rather have coffee with "the skinny". Came across this on YouTube - don't know where it is from but here you have Tom Wright, Richard Rohr and Brennan Manning around a table talking. Wright is the only one talking in this clip. He shares his thoughts about the decline of the church in the West, it's growth in the "developing world", and the possibility of a post-emerging church. Do we live in an age of hyper aesthetic triviality as an anesthetic against meaning and reality? Answers on a postcard to the comments section.